How are annuities taxed in Canada? Income from a registered annuity is fully taxable to the policyholder in the year it’s received. 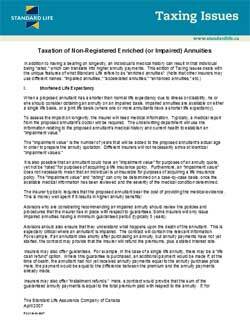 Income from a non-registered annuity can have prescribed or non-prescribed (accrual) tax treatment. For annuities purchased with Registered or Pension funds, all income is 100 percent taxable. Payments from a non-prescribed annuity are a blend of interest and capital. The interest element is taxed as it accrues; therefore the taxation will be higher in the early years of the annuity and decrease over the life of the contract as the capital is paid out. Payments from a prescribed annuity are treated as a level blend of interest and capital and the interest element is taxed on a level basis spread out over the life of the contract.